Brock goes to Pre-K at our church. A program that I love with a teacher that I love where he learns the alphabet and about community helpers and that God loves him. He loves it there too. When I went to parent teacher conferences last fall his teacher kept saying “He has LOTS of friends.” He’s happy. He’s healthy. When Brock was a baby I shopped at a huge consignment sale in the area. He was six months old and I bought clothes for the following fall – size 12-18 months. He never wore those clothes. 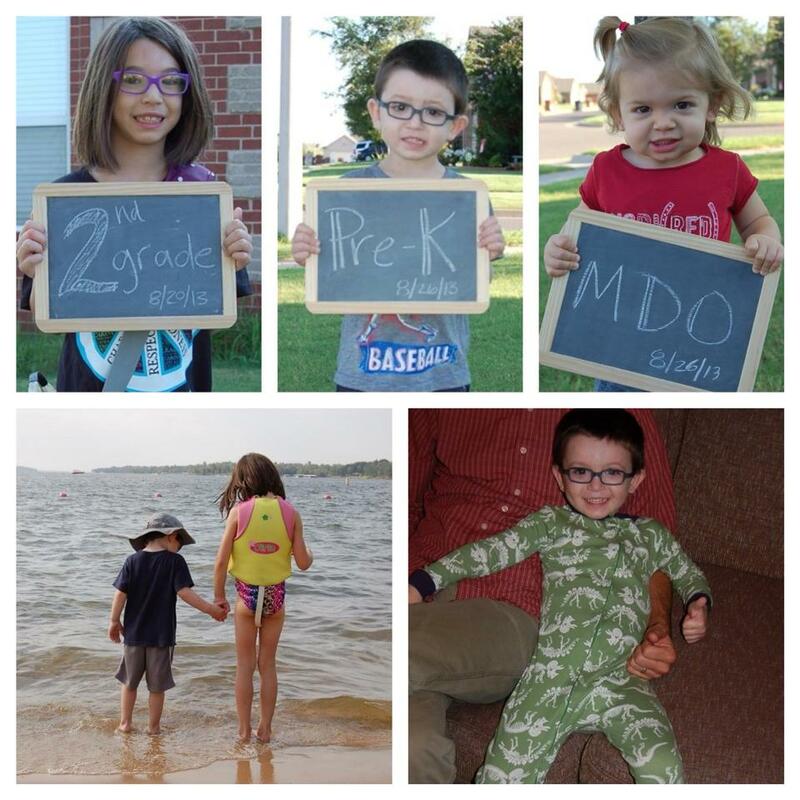 Instead he spent the 11th month of his life in the stem cell transplant unit at Children’s. 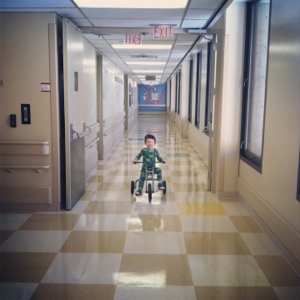 The 12 month was spent in the pediatric intensive care unit. No one wears clothes there. Well, the patients don’t. Everyone else is clothed. Thankfully. He spent the 13th and 14th months of his life back in the stem cell transplant unit. He wore t shirts and socks. When we finally came home his body was so disfigured – his legs were twigs and his belly was enormous – that none of those clothes I bought fit. I felt silly for buying those clothes so far in advance. In hindsight it felt foolishly presumptuous to assume that my baby would still be alive in 6 months. I swore I would never do that again. Brock’s Pre-K teacher is a brave woman. She’s painting with them next week. On t-shirts. Plain white t-shirts. We don’t have one so I found myself (blissfully alone) at Target tonight. I searched and searched the little boy section but couldn’t find one. I walked across the aisle to the big boy section – you know, sizes 5-12. Big boys. And as I grabbed the white shirt off the rack I couldn’t help but think “I never thought I’d be able to shop in the big boy section for Brock.” I never thought we’d make it this far. I never thought he’d live this long. 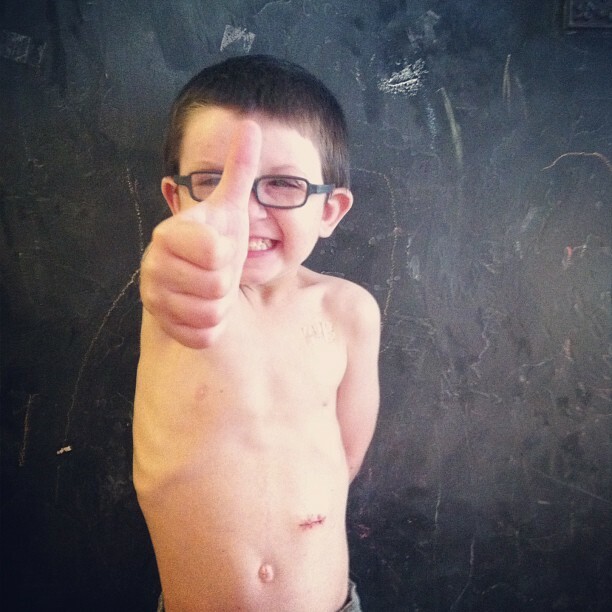 Brock had his port removed two weeks ago and he’s so excited! The surgeon kept it for him in a little container and Brock will show anyone who will look. He’s pretty proud of it. The surgeon also stitched up his feeding tube hole (because the feeding tube had been out for 3 weeks and the hole still hadn’t closed on its own). Unfortunately, that same area is starting to look a little red and possibly infected so we’re going back to the surgeon this afternoon to have it checked out. Brock started Pre-K last month and loves everything about it. Jaycie is in 2nd grade and is very excited to have her favorite teacher and her best friend in the same class. Reese started Mother’s Day Out and thinks she’s big stuff with her backpack and lunch box. Brock wants so badly to swim in the lake once his scars heal. He hasn’t been able to since before he was got cancer at 11 months old. One of the things he’s most excited about after getting rid of his feeding tube is being able to wear footed pjs at night. He couldn’t before, because he had to be hooked up to the feeding pump. *tap tap* This thing on? I’m sorry it’s been so long since I updated you all! We’ve just been busy enjoying summer and less frequent trips to the hem/onc clinic and normal life. If you’ve been following Brock’s facebook page, you know he’s made great strides in re-learning how to eat. So much, in fact, that he had his feeding tube removed 3 days ago! In case you haven’t been around since October 2009, Brock quit eating shortly after he was diagnosed with ALL. Then he moved to the pediatric intensive care unit for 7 weeks, was put on a ventilator, and when he came off the vent, wouldn’t eat anything. He wouldn’t even put anything near his mouth. So it’s been a long, long road with YEARS of therapy to get him to the point where he eats enough calories by mouth. We are forever thankful for the 2 speech pathologist who have changed his life. That doesn’t, however, mean that his feeding issues are over. He still goes to feeding therapy twice a week. He still has strong aversions to many types of food. I imagine it will be years before he ever eats like a “normal” child. BUT. He eats enough to not require a feeding tube and we are ecstatic. And so is he. 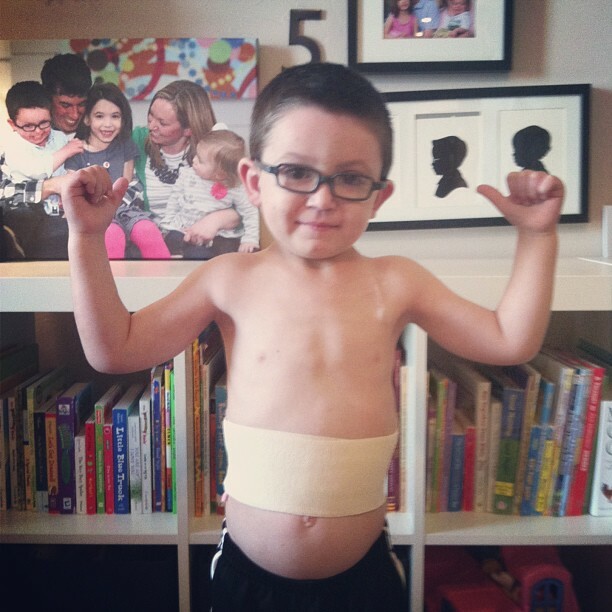 He’s SO proud of himself and tells everyone he sees about how he got his “tubey” out. The last month has been one of the busiest of my life. Largely in part because I decided to join a group of women raising money for St. Baldrick’s. St. Baldrick’s funds more pediatric cancer research than any other organization. 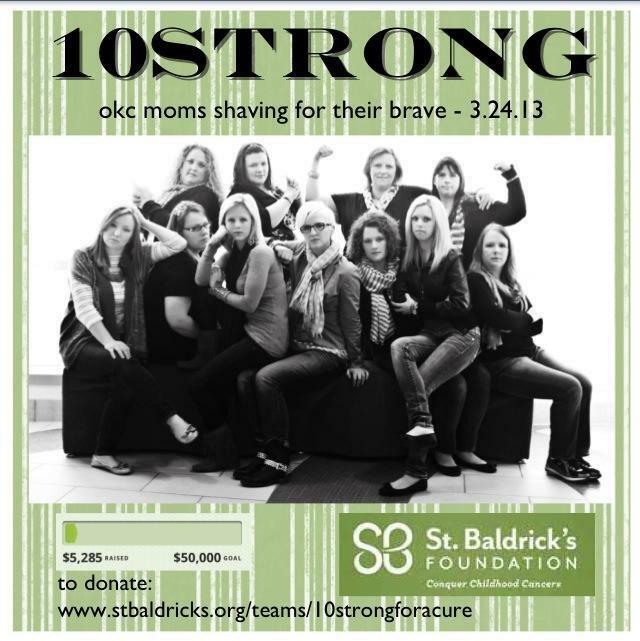 You can find out more about St. Baldrick’s here and you can learn about our group, 10 Strong, here. You can also donate directly to my St. Baldrick’s fundraiser here. And you can buy a tshirt or bracelet (the proceeds of which go to St. Baldrick’s) here. We’re trying to raise $50,000 by next Sunday. Jeannett of Life.Rearranged is helping us with our efforts by hosting a series on childhood cancer. Every Monday for a month, I’ll be guest posting on her blog, sharing pieces of Brock’s story. You can read the first post here and find ways to help out here. Thank you for how you’ve loved and supported us along the way. You all have been the hands and feet of Christ to us and we are extremely thankful. We met with Brock’s oncologist last Wednesday for his last dose of IV chemo and to discuss an end-of-treatment plan. Not because it was the last dose of IV chemo. Not because Brock was just 10 days away from the very end of treatment. Not because we were remembering everything he’s been through. We’re scared to stop the antifungal because what if the fungal infection gets worse. But we’re scared to stay on it because it causes skin cancer. He’s already had one mole biopsied that came back as pre-canceorus, and he has 3 more than need to be looked at. We’re scared. Or at least I am. Jay might be handling it a little better than me. Pray that the fungal infection will heal completely. Pray that, as his immune system recovers from 3.5 years of chemo, it will be able to completely eliminate every last bit of aspergillus. 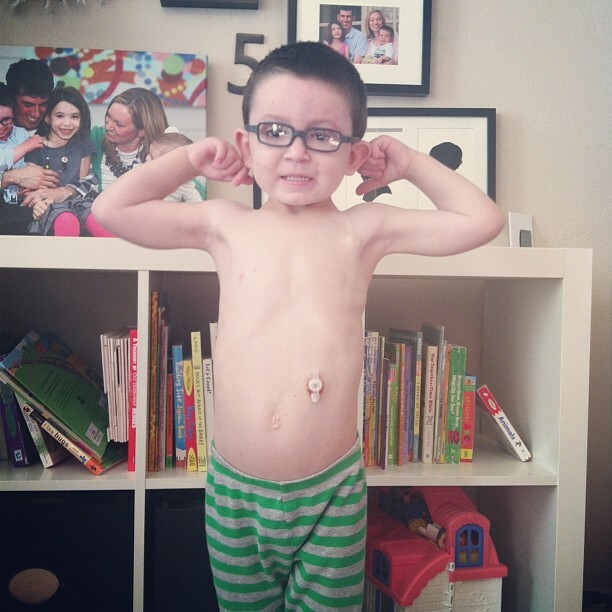 Pray that he stays in remission and that leukemia will never ever be a part of our lives again. Pray that skin cancer will never ever ever be one of his diagnoses. (This is honestly, the one I’m most worried about). 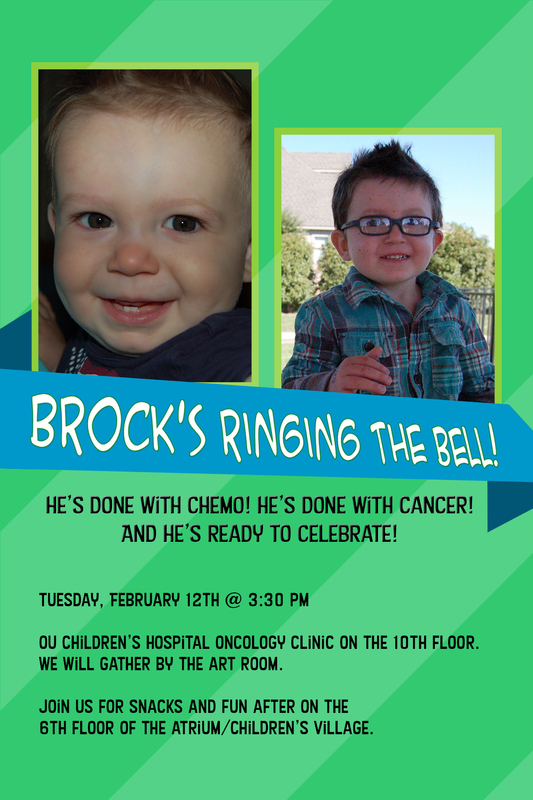 Tomorrow night Brock takes his last dose of chemo. But it’s not over, friends. There are still things to petition God for. However, thankfully, mercifully, so much more to praise Him for. Yes! Please bring your children! I know it’s kind of at an inconvenient time with after school pick up, etc, but we’d love for your kids to come. Are you still having a no-more-chemo party? Yes! Immediately following the bell ringing, we’ll walk over to the 6th floor of the atrium for snacks and fun. Jay and I have been praying the weather will be nice enough for the kids to play outside in the new Children’s Village. I want to get Brock a gift. What does he like? Please do not feel like he needs a gift. The love and support from you all during the last 3.5 years has been gift enough! Besides, he JUST had a birthday and Christmas and he doesn’t need one single thing. 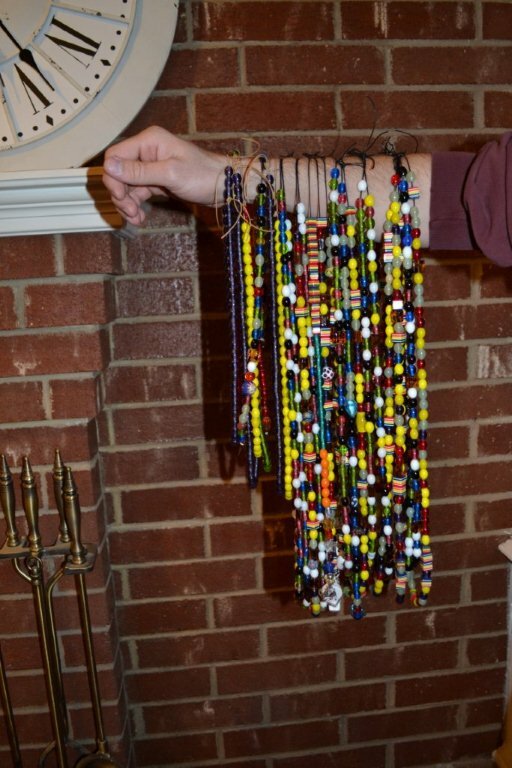 A small group of people known as Brock’s Warriors have worked very hard to have the Beads of Courage program brought to the Children’s Hospital at OU Medical Center. They did this after we (Jay and Vanessa) heard about the program and became very passionate about having it here to help children own their stories of cancer. This video is what started the whole thing in motion. Brock now has a bead for every night he’s spent in the hospital, every poke, every chemo, every clinic visit, every ER visit, every surgery and ct scan and echo and ultrasound, every time he moved to the ICU, each chest tube, each spinal tap. He has a bead for everything that’s happened to him. A tangible way for him to share his story with others. 26 strands. 5.5 pounds. He can’t even wear them all because they’re so heavy. That’s what the last 3.5 years looks like. And each child that starts treatment for cancer at Children’s has the opportunity to do the same. Thanks to Brock’s Warriors. This small group of people have been funding the program on their own for the past 2 years. After much discussion, Jay and I feel like the best way for someone to honor Brock and his accomplishment of finishing chemo is by giving to the Beads of Courage program at OU. We want every child to continue to have the opportunity to tell their story of courage and hope. If that’s something you’d like to do, please contact Jay or I. (If you donate through the Beads of Courage website it won’t go directly to the program at OU.) We’ll also have a little basket set up at the bell ringing where you could drop in your support. Please do not feel obligated to do this. We’re only mentioning it because people have asked and because it’s something we’re more comfortable with than gifts for Brock. You all have been an invaluable means of love and support during the last 3.5 years. We could never thank you enough! We’re hoping you can all join us on the 12th! A day that, for a time, we truly thought we would never see. Thank you for praying, friends. Over and over and over God has been faithful to answer. I don’t understand it but I’m so thankful. Brock came home from the hospital last night. FINALLY recovered from a 2+ week long tummy bug. Jay has had the most mild case of the flu in history. He only had a fever for 1 day and has just felt a little tired since then. I’m so thankful because I cannot manage this crazy life without him and his help. He does so much more than you know. Reese is still sick. After 5 days on antibiotics her ears weren’t any better. We’re trying a new antibiotic now and if she doesn’t show improvement in a few days we’ll have to go see an ENT. It sums up exactly how I feel about the last 3.5 years. In case you missed the last post, Jay has the flu. – that Jay would recover VERY quickly. Like, supernaturally-only-God-can-do-this kind of quickly. – that Brock, Jaycie, Reese, and myself will not get the flu. – that we will get moved to a bigger room so that Reese (who is nursing) can stay up here with me. – rest and patience and provision for our extended family as they step in and help care for the girls. Brock’s still in the hospital.